Aaron Copland's Forgotten Score, 'Quiet City,' Premieres At Last : Deceptive Cadence Quiet City was music that Aaron Copland wrote for playwright Irwin Shaw. Shaw's play of the same name was a flop, and Copland's original score was never published. Now, there's an encore to this story. 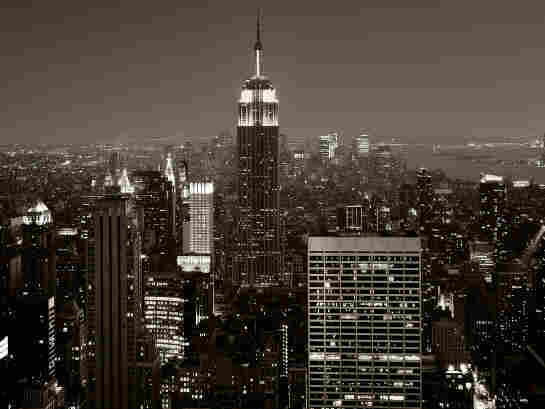 Manhattan, Copland's "Quiet City," at night. 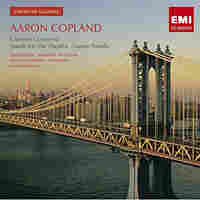 American composer Aaron Copland began work on Quiet City in 1939 and completed it two years later. 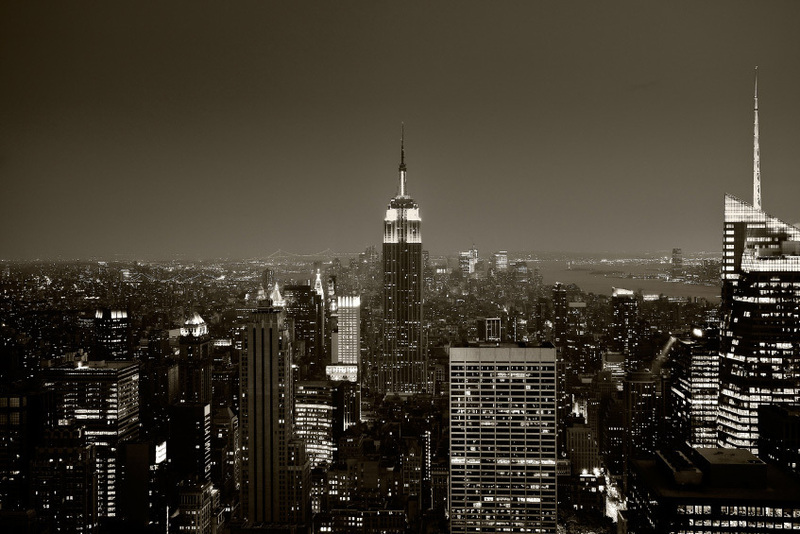 A lonely trumpet and an English horn, backed by hushed strings, offer an ode to New York. The orchestral version of Quiet City is fairly well known, but there's more to this story. Another version has recently come to light. Quiet City was music that Aaron Copland wrote for playwright Irwin Shaw. Shaw's play of the same name was a flop that never made it out of previews — and Copland's original score for trumpet, saxophone, clarinets and piano was never published. 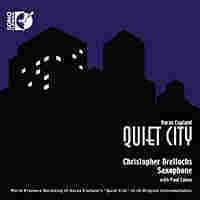 But composer and saxophonist Christopher Brellochs recently unearthed the manuscript and recorded the world premiere of Quiet City in its original form. Two Versions of Copland's "Quiet City"
This first version will be performed by Brellochs at Copland House at Merestead in Mt. Kisco, N.Y. this Sunday afternoon. Brellochs says that he didn't know that this smaller-scored version even existed before he uncovered it. "It was an experience kind of like finding the Holy Grail, to find unpublished music by one of America's iconic concert composers," Brellochs says. "It happened during my doctoral studies at Rutgers University," he continues. After going back and forth discussing all kinds of dissertation topics, he recalls, "My advisor at the time, Paul Cohen, said, 'I happen to have a copy of this that I got from a friend at the Library of Congress,' where it had been collecting dust for over 70 years. And I immediately jumped at the proposition." The play was billed as a "realistic fantasy" or an "experimental drama," Brelloch says, with a central character who has renounced his dreams — and the ramifications of that decision — when he begins to lose his mind. "There's a very poignant scene when he's in Central Park," Brellochs explains. "It's nighttime, and he starts hearing a trumpet playing. The trumpet is the instrument his brother played, and so it has certain meanings within the play. He asks someone passing by, 'Did you hear that trumpet?'" The stranger didn't, nor does a policeman the main character asks as well. "He's really suffering the consequences of not being true to himself," Brelloch says. Yet as interesting and affecting as this play sounds, it didn't even get out of previews. There were a couple of readings, and then the production was cancelled. As Copland wrote to his friend and fellow composer Virgil Thomson, "My career in the theater has been a flop." However, Copland managed to reuse the music. Brellochs calls the Quiet City score "a goldmine of wonderful themes and melodies," some of which found their way into the orchestral version of Quiet City, while a delightful waltz went into the score for the film Our Town. But some of the music has not been available to the general public until now, in Brellochs' new concert version, of which one reviewer said: "Themes that sound grand and romantic over the swell of the strings take on a lonelier, more melancholy quality."